It’s that time of year when those of us in the cold white North are optimistic that spring is here. We are making our summer plans and know we should start to get our horses in shape. Reality sets in and we realize we have limited options on where to ride. Even if you have an indoor facility, going around and around gets old when you are trying to leg up a horse. 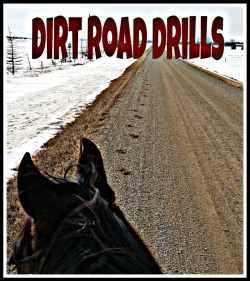 I’ve put together a list of several exercises you can work on while heading out on your long dirt or gravel road. Please remember to use caution on the ice and be mindful of your horses feet if you are on gravel. Stay on the soft edges whenever possible and use slow speeds if the footing is questionable. 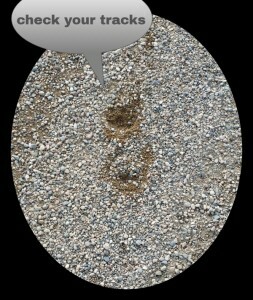 Personally, I’d only go down a gravel road if my horse had shoes on or had booties on his bare feet. If your horse is used to gravel, being barefoot, he trots away in a free stride, and you aren’t worried about abscesses then give it a go. Traveling on hard surfaces can be hard on a horse, but is also said to condition their tendons and ligaments to such. In all cases, use moderation and be sure to warm up and cool out your horse appropriately. If you are are already a member of www.BarrelRacingDrills.com you will be able to click and see more details of each drill (once logged in). If you are not a member and you would like to be, proceed through to the links for more details and to sign up. 1. Start the work out at a walk. You want to encourage your horse to walk out freely and warm up those muscles. 2. Long trot – I’m a stickler for making sure they stay in a trot. No breaking into a lope. They should be moving out freely and staying at the same speed. I will post on each diagonal equally and check for balanced movement and soundness at the same time. I also like to check my tracks to see if he is tracking up evenly (sign of soundness or not). 3. Long trot on contact. I will alternate between riding my horse up into the bridle and having him accept contact and riding on a loose rein. Riding on a loose rein can be much more of a challenge on the way home. 4. Once my horse is warm, I will work on transitions going from a long trot to a slow jog and trot. I will also do a few long trot to a walk transitions. 5. When my horse needs to catch his breath I will work on sidepassing on the go (crossing one side of the road to the other (…watch for traffic!) at a walk) working on leg yielding and shoulder control. 6. I will work on arcing which to me is shoulder control and suppleness in a straight line. This can be done at a walk or trot. 7. I will work on haunches/hip in while going in a straight line (walk and/or trot). This is where I’ll use my leg further back to encourage the hip and hind legs to step to the inside of the tracks the front feet are making. It’s all about body control. 8. When its time to turn around and come home, some horses get a little more pep in their step. I have zero tolerance for jiggy-jogging on the way home. The the horses I’ve trained from the start, have never been allowed to do this so they don’t. It can be a long ride home when we have to do a one rein stop every time they break stride. This can be a long process if you are going to open this can of worms so give yourself enough time to teach the lesson. Patience is needed. 9. If you want to test your work, do some long trotting and use those transitions you brushed up on to keep your horse from breaking stride. 10. I usually use the last leg of the walk home as the cool out period so I try to leave them alone and let them enjoy the ride. The distance you will travel will depend on how much time you have and how good of condition your horse is in. When they aren’t in good shape, it can take as long or longer to cool them out as it took to do the workout so keep that in mind. Sometimes I find it is hard to cool a horse off on the way home when they are walking really fast. In this case I will take the tack off, groom them and hand walk them for a while afterwards to make sure their breathing is back to normal and any lactic acid that has been produced is moving through and out of their systems. If you’d like to read up on more drills, be sure to purchase your full access pass to the site here. We have over 80 drills in the database to help you improve your times and your horsemanship.